Water security is fundamental to achieving any kind of sustainable economic and human development. Cape Town has many identities, including tourist mecca, economic hub and biodiversity hotspot. But its newest identity as poster child for the global water crisis might eclipse the rest. The city’s extraordinary efforts may keep its taps flowing - for now - but the emergency is far from over. Other cities are now wondering what Cape Town’s experience means for them. Could it have been avoided? How? Will similar crises unfold around the world? In 2014, São Paulo and Rio de Janeiro were under the same intense spotlight. They implemented water rationing, with punitive tariffs for over-use and residents hoarding water. 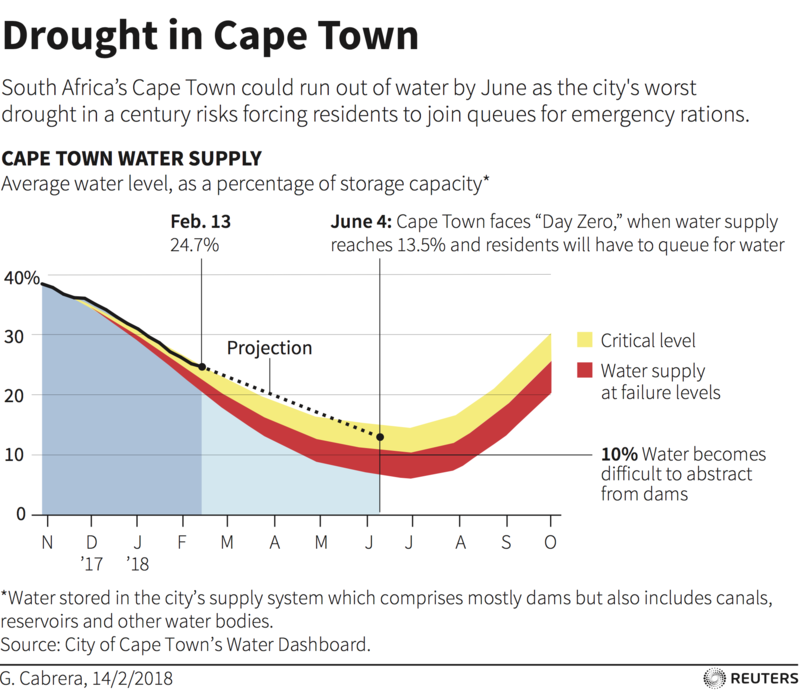 That Brazil’s critical drought is largely neglected in the Cape Town narrative is a cautionary tale for both commentators and actors in the current drama. Rain in late 2015 and early 2016 brought respite to Brazil and an end to the alarmist headlines, but the underlying management and infrastructure problems endure. The politics of water are highly complex. Ultimately, it is about how value and welfare are distributed to industry, agriculture and citizens. Water crises occur when there is a failure by institutions to appreciate the value in having access to reliable water; a failure of governance to ensure that value is allocated both productively and equitably; and a failure of infrastructure to deliver it. Everyone knows that water is essential for life and nearly every aspect of human endeavour. The UN Sustainable Development Goals call out water security in Goal 6, Clean Water and Sanitation, but water security is fundamental to achieving any further kind of sustainable economic and human development. None of the other goals - addressing poverty, hunger and health; mitigating and adapting to climate change; providing affordable energy; creating more sustainable cities and communities - can be achieved without safe and secure water supplies. However, in the economics of water security, water is usually the vehicle of the value, rather than its source. The infrastructure and institutions established to deliver water when and where it is needed determine how economic and social value are created and distributed. It is reliable access to water of a certain level of quality that we value, not just the water molecule itself. This begs the question: are we investing in the most valuable solutions? Most communities tend to rely only on "grey infrastructure" to deliver water security, such as reservoirs, aqueducts, and treatment plants. But experience shows that natural infrastructure, such as the healthy forests, wetlands and river ecosystems from which we source our water supplies, also delivers value. Widespread degradation of watersheds around the world is leading to impaired downstream water quality, and diminished and less reliable flows. Deforestation, poor agricultural practices and other unsustainable land uses have caused moderate to high degradation in 40% of the world’s urban watersheds. Investments in these landscapes should be part of a comprehensive approach to water security. Every city has a different stock of natural capital. The unique ecosystem of the south Western Cape region, home to some of the greatest plant biodiversity on the planet, is threatened by competition from invasive woody plants. The latter are also responsible for drawing up 38 billion litres of water annually from the watersheds that contribute to Cape Town’s municipal water supplies. Managing the ecology of the watershed should be integral to ensuring long-term water security. The Greater Cape Town Water Fund, established by The Nature Conservancy (TNC) in cooperation with partners in the NGO sector and the business community, is working with landowners to remove these invasive species and to restore and protect wetlands and riparian areas that are important for water recharge and supply. As some towns in the watershed are facing up to 40% unemployment, the work has even greater potential value in the jobs created. In the Upper Tana River basin, upstream from Nairobi, Kenya, increased agriculture in the watershed has resulted in heavy runoff and sedimentation in the reservoirs that supply Nairobi’s water. This is causing reduced flows and higher treatment costs. There, as in Cape Town, improving the condition of the watershed should be part of the solution set that delivers valuable water security. By providing education and assistance to farmers, and helping them to implement practices such as cover crops that reduce runoff, TNC is helping to ensure cleaner, healthier flows to the city. But the same practices that reduce runoff can also improve soil health and increase agricultural yields for these farmers. The value is greater than just water delivery. Nairobi is just one example of the integrated value of source watershed protection. By restoring forests and working with farmers and ranchers to improve their land management practices, water quality could be improved and water treatment costs reduced in 80% of more than 4,000 downstream cities, shows research from TNC. This would serve 1.4 billion people around the world. We estimate that for about one in six of these cities - that’s roughly 690 cities serving more than 433 million people globally - the cost of these conservation activities could be fully offset through water treatment savings alone. This indicates that investments in nature are amongst the cheapest option for water security. For most of the others, the return on investment depends on valuing outcomes beyond water security. Improved farming practices can provide more food and income for rural communities, as in Kenya. Restoring forests improves aquifer recharge while also sequestering carbon from the atmosphere. Managing overgrown forests to control wildfire protects water supplies from heavy sediment loads and secures local communities, while also creating new sustainable forestry jobs. By providing this broad range of benefits, source water protection becomes a vehicle for value potentially far greater than that of the water itself. A unique confluence of factors has led to the present situation in Cape Town. It requires a combination of institutional fixes, both regulatory and economic, and investments in infrastructure solutions, both natural and engineered, to solve the city’s ongoing challenges. Still, it is an important reminder of both how vulnerable cities can be to failure in water systems and management, and our need to think creatively about how we solve these challenges. The UN has set ambitious targets in the SDGs to facilitate access to safe water and sanitation. Better understanding how nature can offer integrated water, food and climate solutions is one of our best opportunities for unlocking the investment needed to meet these goals.